I have had a beautiful dirty palomino paint mare for about one year. I bought her when she was lame with high hopes that someday she would be balanced and sound enough to be a nice riding horse. Diva is her name and she is a broodmare. Having babies is what she has always been good at. She is flashy, gorgeous and very level headed. I went against my riding instructor’s advisement when I purchased Diva. Later I questioned if it was really intuition that guided me through the purchase or a very strong ego-based agenda to have what I wanted with her. From that day on I would only think positive supportive things about her condition and would only see her in the potential of her healing. I stopped pointing out what was not working. I never lied or said what was not true, but I would recognize the smallest of improvements such as a lengthening in her stride, brighter eyes, or more movement and flow in her shoulders. I needed to learn to be on her time line and to recognize that the process might take a little longer than my ego based time line. I had to release my attachments and take responsibility for what I was putting into our “relationship space” through my thoughts and voice. As I did she, of course, became sound and ready to ride in just a few short months. I rode her mainly in the arena through the fall and found such joy in her lightness, responsiveness and willingness to listen. Then winter came along and my international travels to teach the EFLC work began. Diva had the winter off. Now it is spring in the Rockies and my favorite time of the year. The foothills are green and the moist gullies and crevasses along the hillsides are popping with yellow, white and purple flowers. Birds are chirping, the sun is warm and the air is cool from the snow that remains on the mountain peaks. I loaded Diva in the trailer and took her to a nearby trailhead that offers sloping hills, some rocky single track in the pines, and open meadows. It was the first trail ride for Diva and she was a rock star. Through the years I have often been asked if EFLC horses should be ridden, and if horses should be ridden at all. What I know to be true about horses is that every horse has different desires, every horse has a different body and level of fitness, every horse may feel more comfortable at one activity or life experience than another. We, as their companions, must learn how to see what brings them joy and fulfills their spirit. My horses work hard in the EFLC programs. 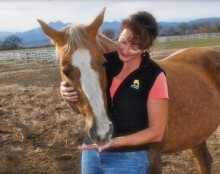 The physical requirement of a trail ride is a healthy balance to the emotional support they offer in the EFLC sessions. Horses are designed to move around. I have yet to experience a horse that does not enjoy a nice walk in the woods, stretching their legs, seeing new territory, smelling the low branches of pine trees, and sneaking a blade of grass here and there. Diva has a solid mind and calming presence. New environments stimulate her mind and senses. Her confidence is raised each time we go on an adventure. As long as she is sound and healthy these trail rides expand her life and awareness. Horses honor us by carrying us on their backs. We can honor them by offering them a variety of new experiences and see what fulfills their spirit. We must be able to see this through complete neutrality and curiosity. To ride or not to ride. . . in my humble opinion, that is a conversation between you and your horse.